When you get to Salles-sur-Verdon, you will quickly notice that it?? ?s a « new » village. The actual old village is submerged in water. Indeed, when the dam was built, the village was moved and set up in its current place, at the beginning of the 1970s. The new village has a few stores, a marina, and a few restaurants. Some of them give you a splendid view on Sainte Croix Lake, ideal for a romantic dinner in a summer night. 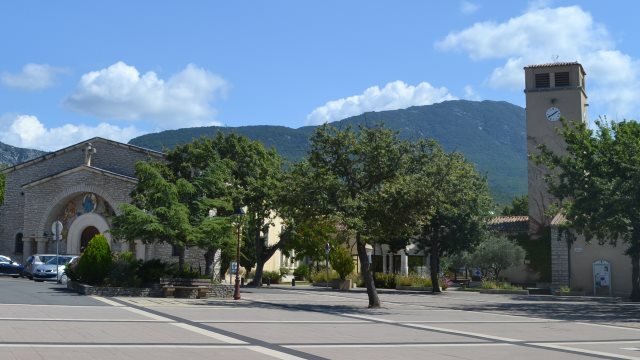 Les Salles is ideally located between Aups and Moustiers Sainte Marie, and not far from Aiguines and its panorama. The many possibilities for rental (campgrounds???) make the village be a very good anchoring point to visit Verdon. However, historical villages enthusiasts might be disappointed, but they will still enjoy the pleasure of visiting the region. In front of the village, there is Coste-Belle island. It?? ?s totally possible to cross by paddle boat, and you will find some nice beaches around there. Les Salles is one of the three villages marking out Sainte Croix Lake with Bauduen and Sainte Croix du Verdon. - Toine path - The old village memorial - Sainte Croix Lake What to know A little path allows you to go down to the lake banks. Lesgorgesduverdon.fr is a benchmarking site to discover the Verdon Canyon, the Verdon and its natural park, one of its most beautiful regions of Provence. The Verdon, the villages, the Sainte-Croix Lake and the other lakes around shall have no secret for you thanks to numerous practical details including access data, all on our site.